Shop Small - Win Big! 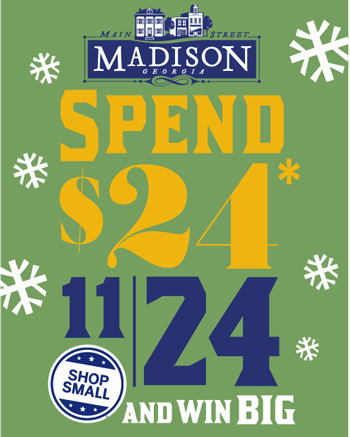 Join us to celebrate Small Business Saturday in Downtown Madison on November 24, 2018. Show your support for the small independent businesses that make up our great Downtown. When you spend $24 with one of our merchants - stores, salons, spas, and restaurants are all included - your name will be entered* into a drawing to win one of two $100 Downtown Dollar gift certificates. Winners will be posted on the Main Street Madison Georgia Facebook page by Friday, December 1, 2018. * One entry per customer, per store.